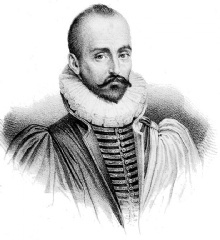 Michel de Montaigne was a famous Philosopher from France, who lived between February 28, 1533 and September 13, 1592. He became 59 years old. Michel Eyquem de Montaigne was a French philosopher and writer, primarily known for his genre-creating essays. He was the one who first used the term essay ("attempt, sketch, experiment, practice, drill") on his literary works, and he is regarded as the originator of what we today call the informal essay. He is born under the zodiac pisces, who is known for Fluctuation, Depth, Imagination, Reactive, Indecisive. Our collection contains 84 quotes who is written / told by Michel, under the main topic Marriage. "There is not much less vexation in the government of a private family than in the managing of an entire state"
"Poverty of goods is easily cured; poverty of soul, impossible"
"I write to keep from going mad from the contradictions I find among mankind - and to work some of those contradictions out for myself"
"The finest souls are those that have the most variety and suppleness"
"The ceaseless labour of your life is to build the house of death"
"If a man urge me to tell wherefore I loved him, I feel it cannot be expressed but by answering: Because it was he, because it was myself"
"If a man should importune me to give a reason why I loved him, I find it could no otherwise be expressed, than by making answer: because it was he, because it was I"
"There is no desire more natural than the desire for knowledge"
"The confidence in another man's virtue is no light evidence of a man's own, and God willingly favors such a confidence"
"I prefer the company of peasants because they have not been educated sufficiently to reason incorrectly"
"Stubborn and ardent clinging to one's opinion is the best proof of stupidity"
"It is not death, it is dying that alarms me"
"The public weal requires that men should betray, and lie, and massacre"
"Love to his soul gave eyes; he knew things are not as they seem. The dream is his real life; the world around him is the dream"
"If ordinary people complain that I speak too much of myself, I complain that they do not even think of themselves"
"The entire lower world was created in the likeness of the higher world. All that exists in the higher world appears like an image in this lower world; yet all this is but One"
"I quote others only in order the better to express myself"
"Wit is a dangerous weapon, even to the possessor, if he knows not how to use it discreetly"
"When I play with my cat, who knows whether she is not amusing herself with me more than I with her"
"We only labor to stuff the memory, and leave the conscience and the understanding unfurnished and void"
"We can be knowledgable with other men's knowledge but we cannot be wise with other men's wisdom"
"We are Christians by the same title as we are natives of Perigord or Germany"
"Virtue rejects facility to be her companion. She requires a craggy, rough and thorny way"
"Valor is stability, not of legs and arms, but of courage and the soul"
"There is a sort of gratification in doing good which makes us rejoice in ourselves"
"There are some defeats more triumphant than victories"
"The worst of my actions or conditions seem not so ugly unto me as I find it both ugly and base not to dare to avouch for them"
"The world is but a perpetual see-saw"
"The world is all a carcass and vanity, The shadow of a shadow, a play And in one word, just nothing"
"The way of the world is to make laws, but follow custom"
"The value of life lies not in the length of days, but in the use we make of them... Whether you find satisfaction in life depends not on your tale of years, but on your will"
"The thing I fear most is fear"
"The strangest, most generous, and proudest of all virtues is true courage"
"The soul which has no fixed purpose in life is lost; to be everywhere, is to be nowhere"
"One may be humble out of pride"
"Once conform, once do what others do because they do it, and a kind of lethargy steals over all the finer senses of the soul"
"Of all our infirmities, the most savage is to despise our being"
"Nothing is so firmly believed as what we least know"
"Nothing fixes a thing so intensely in the memory as the wish to forget it"
"Not being able to govern events, I govern myself"
"No pleasure has any savor for me without communication"
"My trade and art is to live"
"My life has been full of terrible misfortunes most of which never happened"
"It is good to rub and polish our brain against that of others"
"It is an absolute and virtually divine perfection to know how to enjoy our being rightfully"
"It is a sign of contraction of the mind when it is content, or of weariness. A spirited mind never stops within itself; it is always aspiring and going beyond its strength"
"It is a monstrous thing that I will say, but I will say it all the same: I find in many things more restraint and order in my morals than in my opinions, and my lust less depraved than my reason"
"In true education, anything that comes to our hand is as good as a book: the prank of a page- boy, the blunder of a servant, a bit of table talk - they are all part of the curriculum"
"In nine lifetimes, you'll never know as much about your cat as your cat knows about you"
"Ignorance is the softest pillow on which a man can rest his head"
"If you don't know how to die, don't worry; Nature will tell you what to do on the spot, fully and adequately. She will do this job perfectly for you; don't bother your head about it"
"If there is such a thing as a good marriage, it is because it resembles friendship rather than love"
"I know well what I am fleeing from but not what I am in search of"
"I have often seen people uncivil by too much civility, and tiresome in their courtesy"
"I have never seen a greater monster or miracle in the world than myself"
"I do not speak the minds of others except to speak my own mind better"
"I do myself a greater injury in lying than I do him of whom I tell a lie"
"I care not so much what I am to others as what I am to myself. I will be rich by myself, and not by borrowing"
"How many things we held yesterday as articles of faith which today we tell as fables"
"How many condemnations I have witnessed more criminal than the crime!" "He who fears he shall suffer, already suffers what he fears"
"He who establishes his argument by noise and command shows that his reason is weak"
"Fortune, seeing that she could not make fools wise, has made them lucky"
"For truly it is to be noted, that children's plays are not sports, and should be deemed as their most serious actions"
"Few men have been admired of their familiars"
"Fame and tranquility can never be bedfellows"
"Every one rushes elsewhere and into the future, because no one wants to face one's own inner self"
"Every man bears the whole stamp of the human condition"
"Even from their infancy we frame them to the sports of love: their instruction, behavior, attire, grace, learning and all their words azimuth only at love, respects only affection. Their nurses and their keepers imprint no other thing in them"
"Death, they say, acquits us of all obligations"
"Covetousness is both the beginning and the end of the devil's alphabet - the first vice in corrupt nature that moves, and the last which dies"
"Confidence in the goodness of another is good proof of one's own goodness"
"Confidence in others' honesty is no light testimony of one's own integrity"
"Any person of honor chooses rather to lose his honor than to lose his conscience"
"An untempted woman cannot boast of her chastity"
"Ambition is not a vice of little people"
"Age imprints more wrinkles in the mind than it does on the face"
"A wise man sees as much as he ought, not as much as he can"
"A wise man never loses anything, if he has himself"
"A straight oar looks bent in the water. What matters is not merely that we see things but how we see them"
"A man who fears suffering is already suffering from what he fears"
"A good marriage would be between a blind wife and a deaf husband"